It’s been a crazy few months in our house – hence no blog posts for a while. Since June, we’ve managed to move house, move schools and start on the pump, so both cooking and blogging have taken a back seat. This recipe is the result of running out of time and discovering that shortcuts can be surprisingly good. It’s almost a moussaka, because I started with the best intentions, following a recipe from bbcgoodfood.com. I’d got as far as roasting the aubergines and simmering the mince, but then it was school pick-up time, and once the kids got home, I quite frankly couldn’t be bothered with the potato layers and yogurt topping. So it’s ended up as a low-carb, lower fat alternative, which can’t be a bad thing. Serve it with some strips of warm wholemeal pitta bread on the side to dip into the mince if your kids need some starchy carbs. Heat 1 tbsp oil in a large pan. Tip in the onion and garlic and fry for a few minutes, then add the carrots and cook for another couple of minutes. Stir the meat into the pan, and fry it until the meat is browned. Pour in the wine and briefly cook until most of the liquid has evaporated. Stir in the cinnamon and allspice. Tip in the tomatoes, tomato purée and 1 tbsp water, and stir it all together. Season with some pepper, add the oregano and parsley, cover, then simmer on a low heat for 50 mins, stirring occasionally. While the meat cooks, prepare the aubergines. Heat the oven to 200C/fan 180C/ gas 6. Brush a little oil onto 2 large baking sheets. Mix the rest of the oil with the lemon juice. Slice the aubergines into 1cm thick slices, then lay them on the oiled baking sheets. Brush with the oil and lemon mix, then season with pepper. Bake for 20-25 mins until soft, then set aside. Lower oven to 180C/fan 160C/gas 4. Spread half the meat mixture on the bottom of an ovenproof dish. 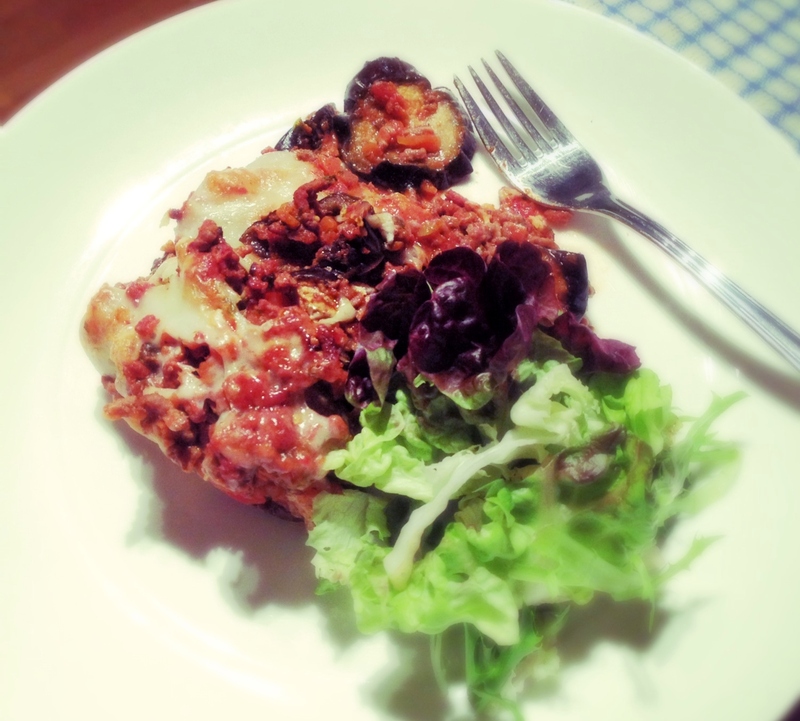 Overlap the aubergine slices on top and then spoon over the rest of the meat mixture. Sprinkle a mixture of grated mozzarella, low fat cheddar and parmesan over the top, and bake in the oven for about 20 minutes until bubbling. Serve with a green salad and warm strips of wholemeal pitta bread. Previous Post Is it rice or is it pasta?